Gardening can be intimidating if you’re new to it, or if you’ve had any disappointing experiences with it in the past. 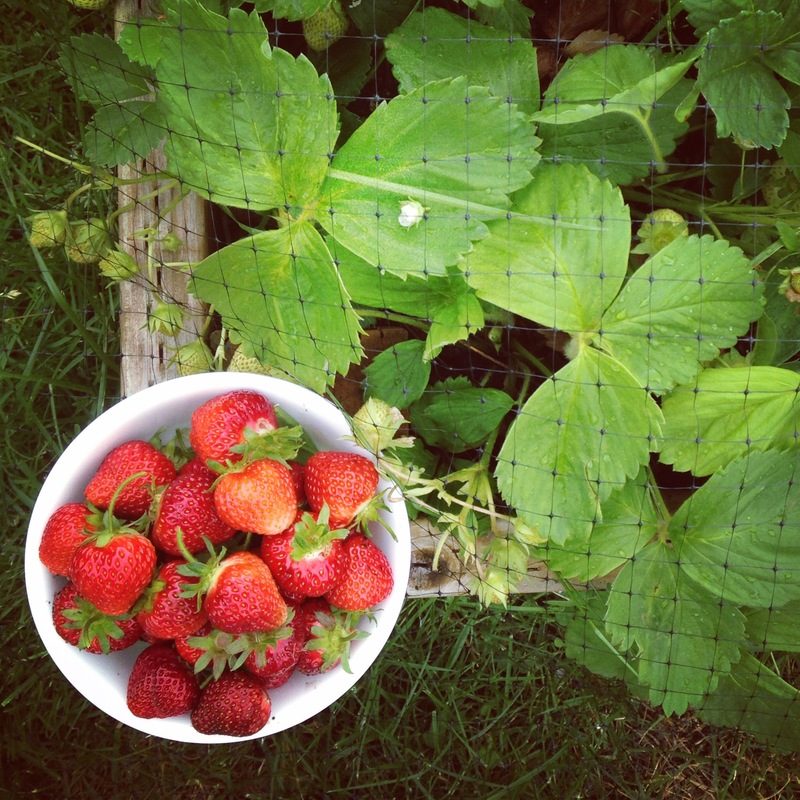 The first year I gardened, it was a pretty big disaster, but every year after that has been so much more successful. 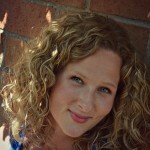 Today I’m sharing with you 10 things that have personally grown really well for me. If you don’t know where to start, try using this list and feel free to ask questions! Some starts (ask around, a friend might have some to give you or go find some at the store). An enclosed area like a raised bed or large container, or a spot in your garden that you’re okay with not tilling up each year. An area with lots of sun and well drained soil. A net to go over your plants to keep the birds away. Rhubarb is another one of those amazing plants that comes back every year. Our rhubarb plant came from a friend who had dug part of hers up. We planted it in a semi-shady area and with very little maintenance, it did great. 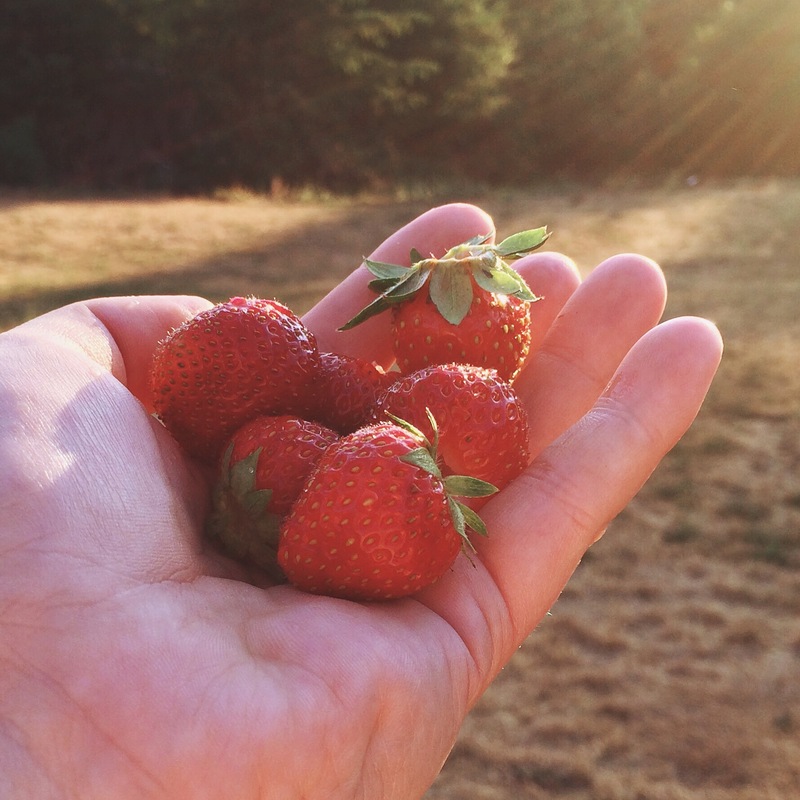 Think of fresh rhubarb crisp or strawberry rhubarb pie in the summer. Yum! Oh garlic….we love it so much, don’t we? Garlic was one of the first things I ever planted and it’s never failed me. 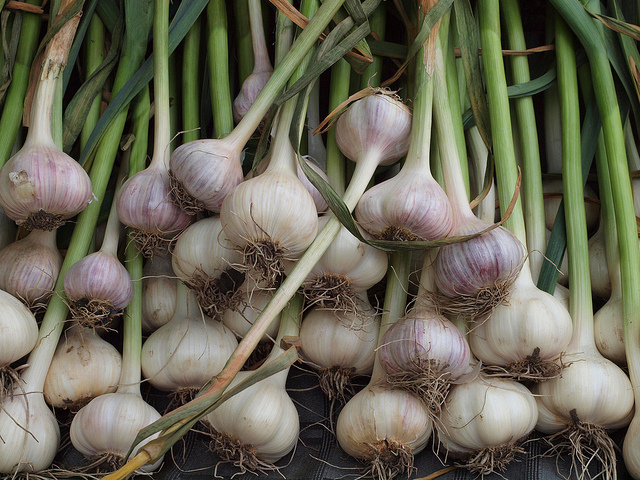 For a complete tutorial on growing garlic, click here. 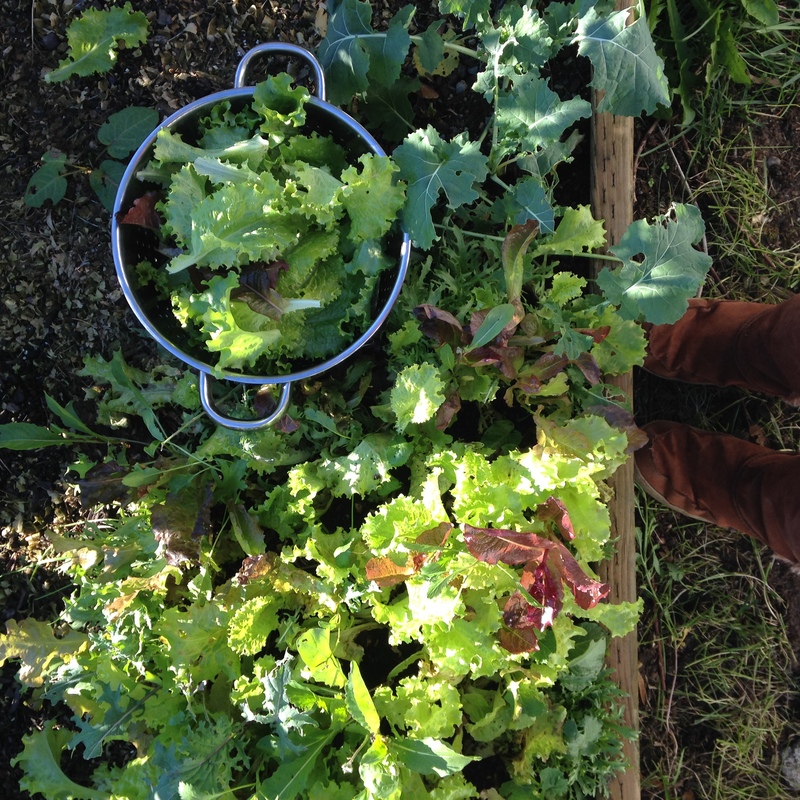 There’s nothing more rewarding then stepping out to the garden and harvesting a salad right before dinner. Salad greens are very easy to grow and they can be grown in raised beds, the ground or even containers on your porch. See the lettuce growing below? It’s happy in a little pot. 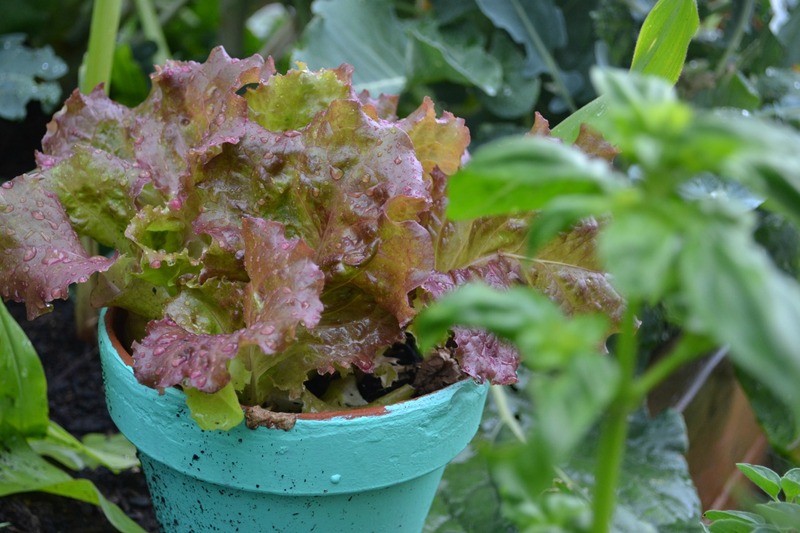 You can grow your own salad, even if you live in an apartment. Try it! 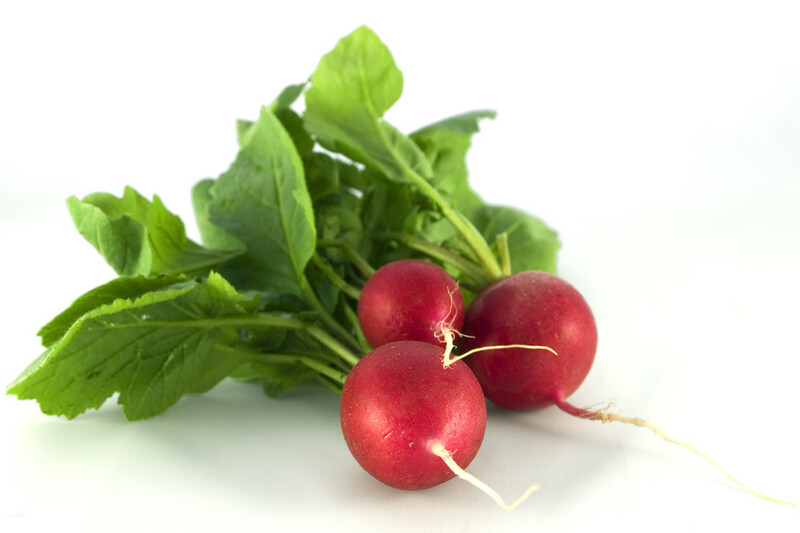 Radishes are like the ultimate self esteem boost for the beginning gardener because they grow quickly and they hardly ever fail. They’ll go great with your salad greens or you can even pickle them to make them extra delicious! Beets are a fast growing crop that can be grown just about anywhere. Although beets are known as a root crop, all parts of the beet plant are edible. Tender beet greens can begin being harvested when thinning a row of beets. 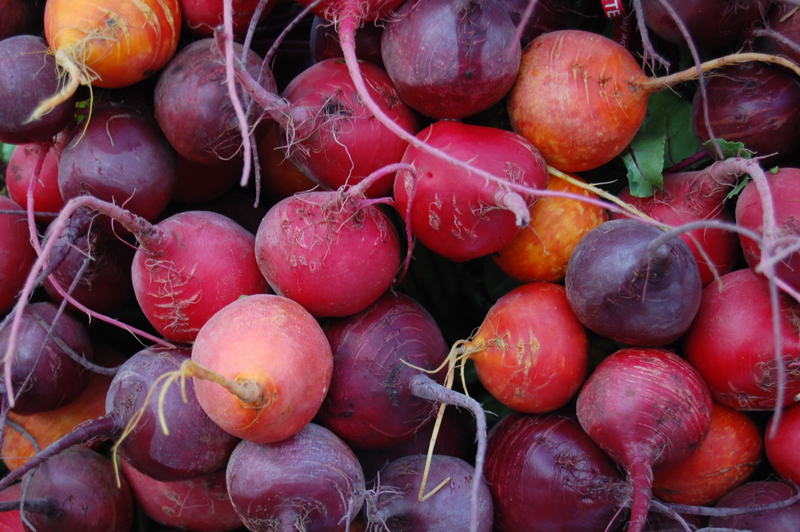 Beets are wonderful steamed and sprinkled with salt, or pickled over salads. You can even pickle your radishes and beets together! Have you ever picked a carrot, hosed it off and then ate it while still outside? The flavor blows store bought carrots away! 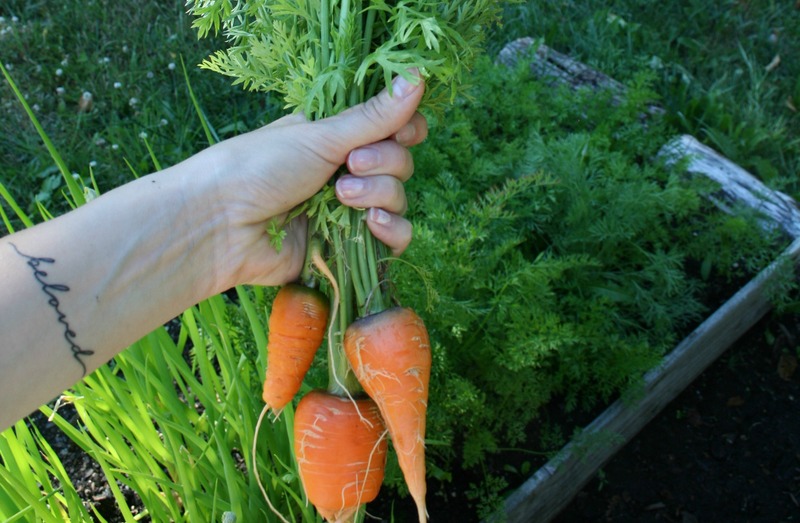 Carrots are resistant to most pests and diseases, and are a good late season crop that can tolerate frost. Not all carrots are orange; varieties vary in color from purple to white. Have a sunny location and a large container? Try growing your own tomatoes. 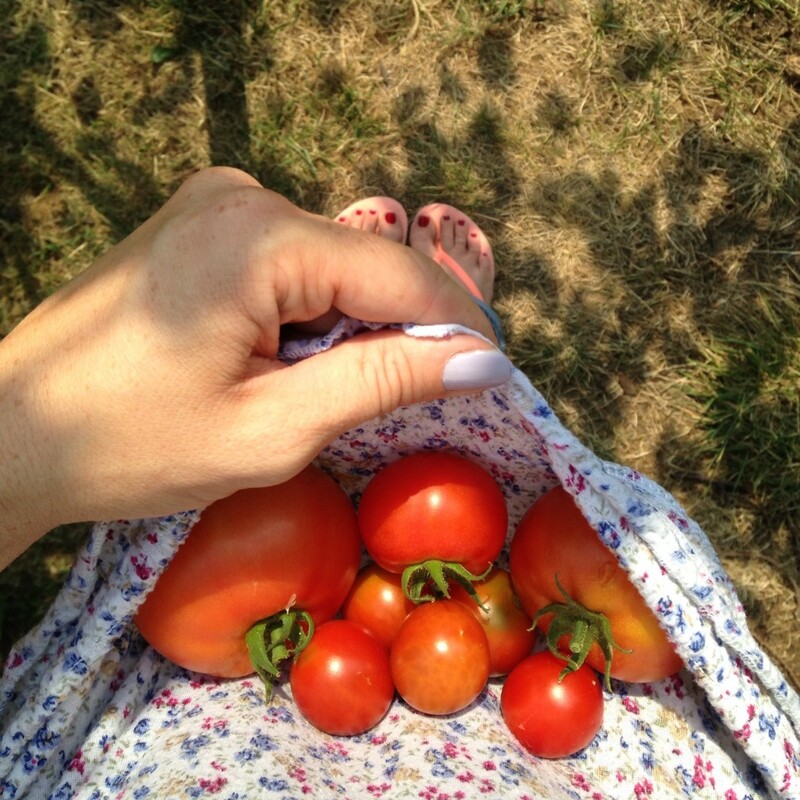 In late spring/early summer, you can pick up tomato starts outside most stores. 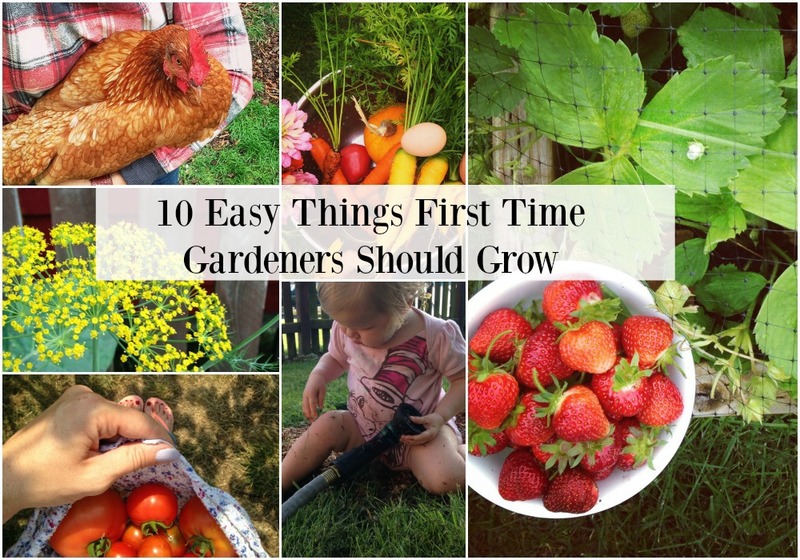 Try growing a variety of kinds. They love the heat, a good watering and well drained soil. 9. Fresh herbs such as dill, cilantro, rosemary, lavender, and basil. Herbs such a rosemary and lavender will grow year after year and many other herbs, grow wonderfully from seed. Either get some seeds in the ground, pick up a start at the store or get one from a friend. There are endless things you can do with fresh herbs and many of them are so easy to grow. 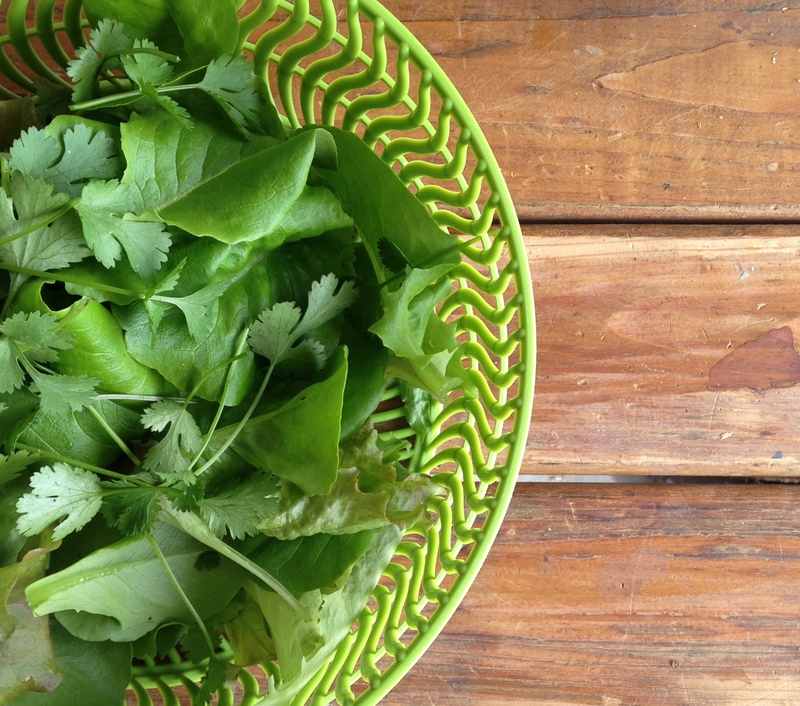 Cilantro grows well when it’s cool and damp outside, while other herbs such as basil like warm, sunny weather. 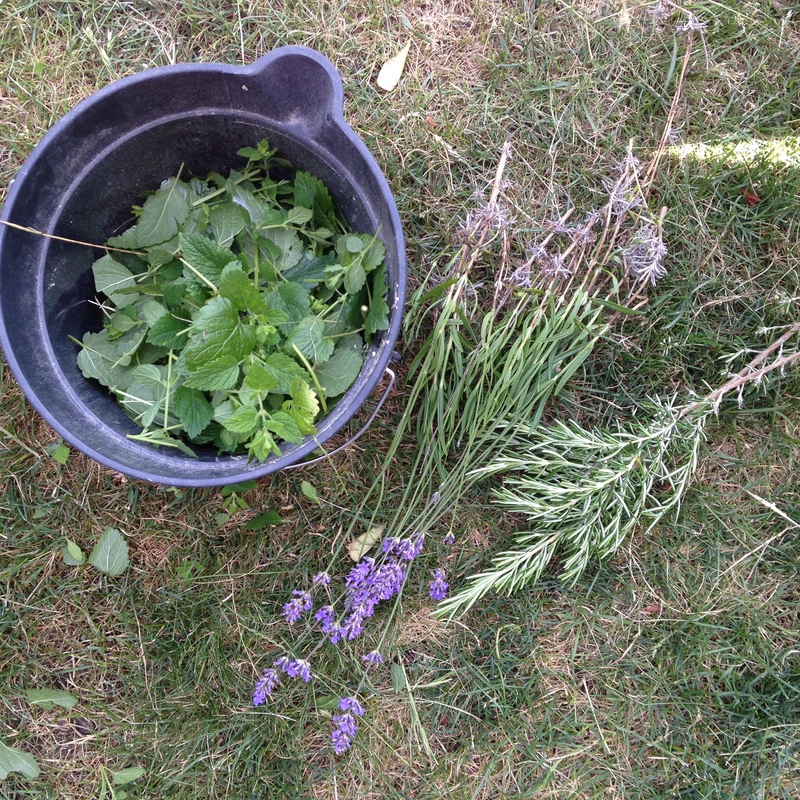 Lavender, mint and rosemary. I love putting these herbs in our chicken coop after we clean it. 10. Long lasting cut flowers like zinnias or sunflowers. When you go out to harvest your salad greens, herbs and veggies, you should be able to bring in some flowers to put on your table or in the windowsill as well. Try growing some zinnias or sunflowers. These flowers will last over a week inside. 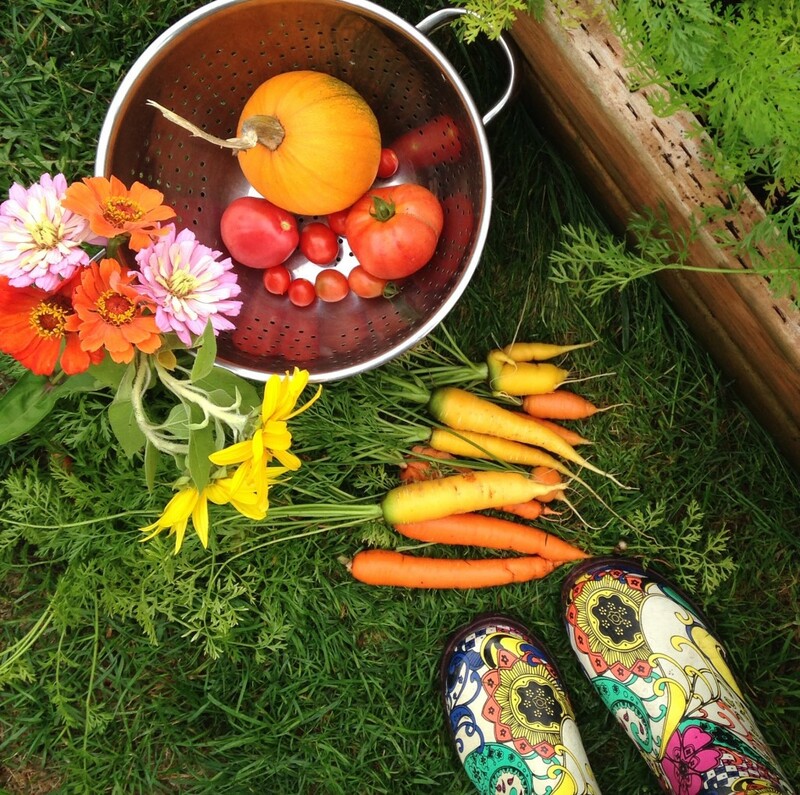 What are some of the things you’re excited to plant in your garden this year? What has grown well for you in the past? I have enjoyed growing Kale because it is packed with vitamins and minerals. It comes up again in the Spring and is very pretty in the garden. I use it for stir fry or soup. 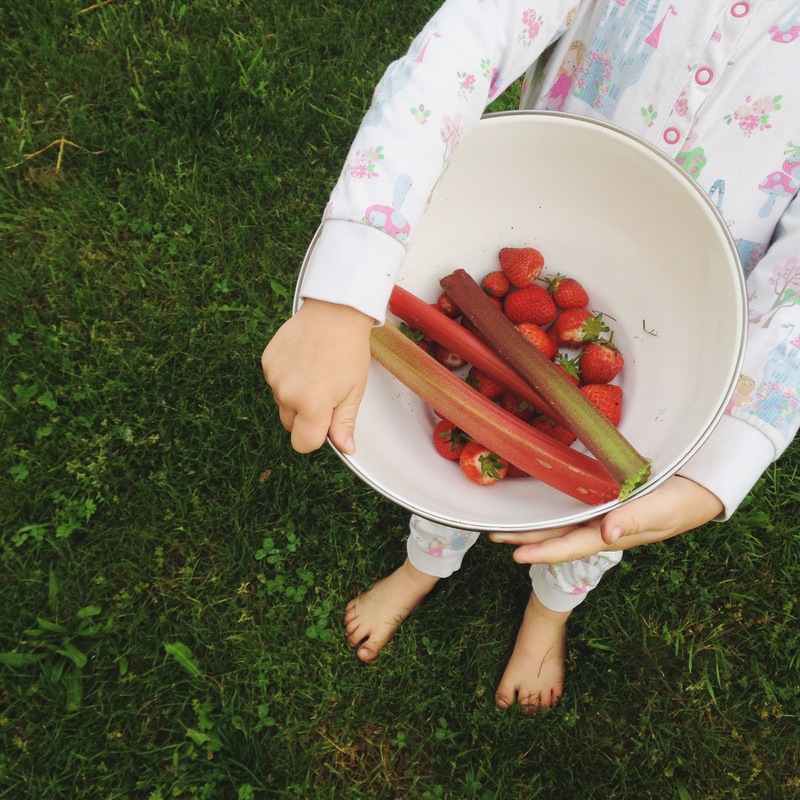 Rhubarb is so much fun to grow! Make sure you plant it in an area with a little shade. It won’t like bright, hot, constant sun. Enjoy gardening in this wonderful area! We’ve always used raised beds and haven’t had too much of an issue. Covering with a net could help, especially when the plants are small. Lots of people garden successfully around here,w despite the rabbits. If I was you, I’d plant lots (enough for you and them!) and just give it a try!